Timed to coincide with the launch of Singapore Art Week, running January 16-24, iPreciation unveiled 13 monumental works located around Singapore’s civic district, including a new work by internationally acclaimed artist Gu Wenda and several whimsical pieces by Taiwanese sculptor Ju Ming. Gu’s work, Forest of stone steles — Story of solar calendar, is an installation of 24 ‘ru’ rocks in different shapes and sizes, a project that has taken him more than 20 years to realize. Each huge pieces of natural rock came from the sea bed, billions of years old, these pieces of limestone have been shaped by the sea water and covered with aquatic specimens that remain in fossilized form as part of the stone and now integral to the installation. The artist has inscribed the rocks with a simplified Chinese calligraphic character that references Chinese solar terms. Indonesian artist Sri Astari Rasjid will debut her latest work, Armor for Change, a monumental kabaya (traditional blouse worn by Indonesian women) cast in aluminum, while Singaporean artist Chen Sai Hua Kuan is bringing home Ling Ting 2, an interactive sound sculpture that premiered on the steps of the Grand Palais in Paris during the Art Paris exhibition last March. 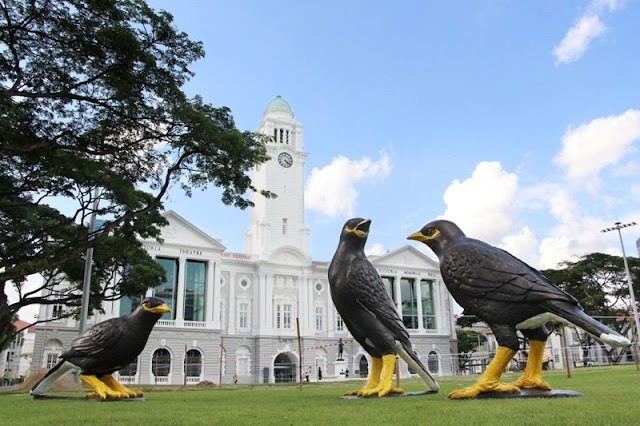 Lim Soo Ngee has created Mynas, an installation of larger than life bird sculptures that references the local native bird species that have been dwindling drastically and are now out-numbered by foreign species. Following a four-city tour in China last year, Ju Ming’s recent Living World Series — a set of 10 painted bronze sculptures of people in life-size should prove to be a draw with the public for their lifelike quality. The overall title of the exhibition, running until April, is Envision, which is a reference to the human desire to dream big, and an appropriate moniker for the show that is ambitious in its scale, spread from the Fullerton Bay Hotel to the Asian Civilations Museum and Arts House.